We all benefit when young people understand their strengths and talents and use these to make the world a better place through direct action, service, and leadership. We use the idea of vocation to describe this process of them coming to understand their strengths and talents and how these can be applied to address issues they care about in their community. Vocation captures the idea that young people live in a world that poses questions to them and their life is often the answer to these questions. In our own work with young people, we never met a young person who did not have a public issue that they cared about on a personal level. They all heard at least one question the world was asking of them. Raising young people’s awareness about what issues matter to them and the strengths and talents they have facilitates learning about their vocation: how they can “make a difference” In our experience, seeing young people as having a vocation challenges common youth programs, services, and policies, which understand young people as deficient and not ready to take on real issues that matter to them. Youth programs, services, and policies often work to create oases for young people to protect them from what is going on in their neighborhoods and often limit what information they receive as well as what questions they can ask. Having access to safe spaces, this year’s international youth day theme, facilitates and supports young people learning about their strengths and how they can make a difference on issues they personally care about—their vocation. The access to safe spaces correlates with positive identity development, political efficacy, wellbeing, and empowerment. The idea of vocation strengthens our understanding of these spaces by aligning them to values of participation, inclusion, and creativity and practices the amplify youth voice, youth involvement in decision-making, and youth action. The idea of vocation also challenges the concept of safe space, reminding us that safety should not equate to limiting information or removing risk. Vocation provides a useful frame in designing and facilitation youth safe spaces. The access to safe spaces correlates with positive identity development, political efficacy, wellbeing, and empowerment. There is lack of invitation for young people to apply their strengths and talents to make a difference. Instead young people receive messages to wait, hold back, and focus on self-development, while simultaneously being told they are self-absorbed. To add to the inconsistences facing young communities, the world refers to the younger populations as the “next generation” or “the future”, while core systems don’t allow this next generation to have a say in what their future looks like. In these tumultuous times, safe spaces provide ballast and opportunity that young people may not find in broader society. The danger is to take the metaphor of safe and safety too far. While opportunities for young people to discuss ideas that matter to them, work out ways of responding, and taking joint action on these are required, we have to be aware that too often these spaces can work to isolate and segregate young people from broader discussions and direct action. Safe spaces work best when they invite courage and acceptable risk, and create opportunity roles for young people. Those who have worked with young people in violent, marginalized, and excluded communities have substituted safe spaces for dignity, courageous, and/or challenging spaces. They make these revisions to illuminate the purpose of safe spaces. These are only short-term oasis from the troubling situations in society. When safe spaces become isolating and segregating spaces the world loses. We lose the strengths and talents young people possess that should be contributed now to creating a better world—to making a difference. Featured image credit: Balcony by Devin Avery. CC0 via Unsplash. Michael Baizerman, PhD, MS, MS, is Professor and Director, Youth Studies, School of Social Work, University of Minnesota, and Adjunct Professor of Youth Development Leadership, University of Minnesota. He has taught in Youth Studies since 1972 and also carried out community-consultation on youthwork and youth studies locally and internationally. Ross VeLure Roholt, PhD, MSW, is Assistant Professor, Youth Studies, School of Social Work, and University of Minnesota. Before joining the Youth Studies faculty, Dr. VeLure Roholt worked for two years in Belfast, Northern Ireland on issues around youth civic engagement and youthwork practice. He has consulted both locally and internationally on youthwork practice, especially in Jordan, Israel, and Palestine territories. 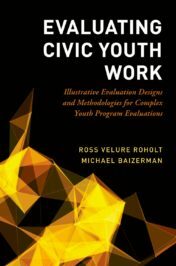 They are the authors of Evaluating Civic Youth Work and Civic Youth Work, published by Oxford University Press.